Osteria da Clara is a little, new Italian place with modest prices and lofty culinary aspirations. It took over the space once occupied by Valleta in Vršovice, just over the line from Vinohrady. I thought Valleta, loved by some, was a reasonably-priced, if imperfect attempt at adventurous and creative cooking. It was interesting and different but never excited me. 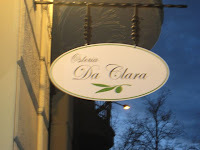 A couple of visits to Osteria da Clara the first week after it opened has me interested. And at least two dishes me excited. There were imperfections, but I think (and hope) those can be attributed to the restaurant's newness. The small dining room has changed in subtle ways from the Valleta days, with a nicer chairs and rearranged tables. But there were only around eight of them. There was also a better looking, stained wood cover for an overhead air vent. But they should get rid of the beat up, old couch near the front door. It brings down an otherwise clean-looking space. Meals began with chewy, crusty bread. 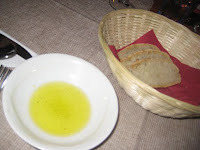 It came with a strong olive oil that had a pleasant, ever-so-slightly bitter finish. For a starter during a solo outing, I had the crostini misti (95 CZK). There were three different offerings on the plate. Toasted bread covered with chopped chicken liver, toasted bread with chopped tomatoes, sun-dried tomatoes, olive oil, and basil, and warm polenta topped with melted cheese. 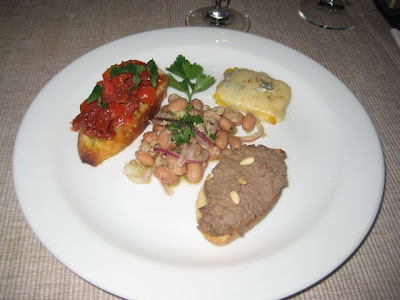 Amid the crostini, there was white bean salad with red onion and a bit of tuna fish. 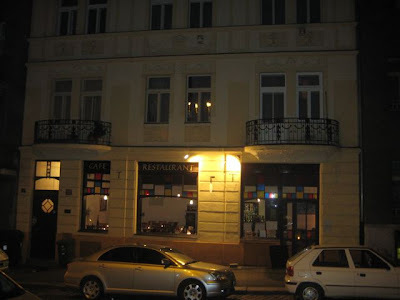 This unadvertised addition was also offered as a separate starter (95 CZK). I'm a chopped chicken liver fan . In the old days, I used get tubs of it at a New York deli and make sandwiches. I enjoyed this version. The chopped tomato crostini was basic but tasty. I thought the addition of the sun-dried tomatoes was a good idea. I believe the polenta had a blue cheese on top. It was a small serving, but enough -- it had a pungent kick. 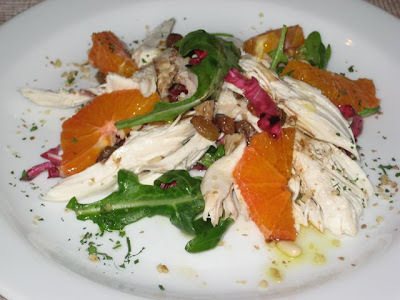 On the second visit, I ordered the insalata di pollo antica -- chicken salad with walnuts, raisin, and orange (95 CZK). There were a few rucola leaves and splashes of balsamic vinegar and olive oil. The chicken, served cold and shredded, was nicely prepared. It could have used more seasoning. All the ingredients were fresh and good quality, but I thought the dish didn't pull together as a whole. Looking back, I'd have cut up the chicken, orange, and rucola into smaller pieces at the start, tossed them together, and added a touch more dressing. But maybe that's just me. I did this as I was finishing it and enjoyed the salad much more. 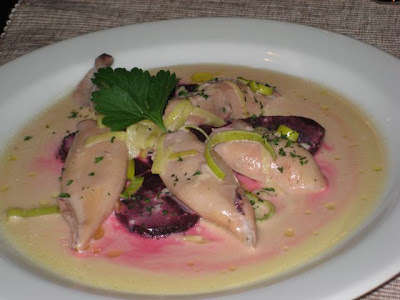 I tried the calamari caldi con barbabietole -- warm squid with beetroot, leaks, white wine and cream (115 CZK). The squid were tender, but unspectacular when considered on their own merits. However, the sauce was the star here. The mixture of the wine and cream, along with the added calamari flavor, had us soaking it up with our extra bread. Only the bland beets were a disappointment. 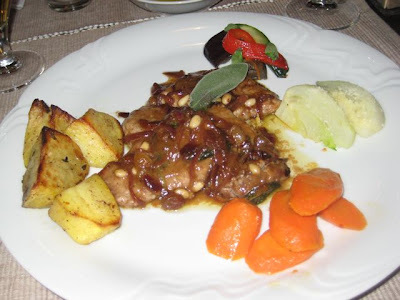 For a main course on my first visit, I got the fettine di maiale -- pork fillet with pine nuts and balsamic vinegar (235 CZK). I absolutely loved this. The thick, brown coating on the meat tasted like a lovely Marsala wine sauce. There were unannounced raisins, giving it natural sweetness. Fresh sage took it to another level. Fantastic. I asked the waitress about the sauce. After consulting with the kitchen, she said it was actually made with table wine, but that the carrots were cooked in Marsala. The carrots were perfect -- warm, but still with some snap in them. There was cold, anise-influenced fennel and a small amount of cold, roasted eggplant, red pepper, and zucchini. The roasted potatoes had potential, but weren't as good as they could have been. Also, the pork was just a little tough. 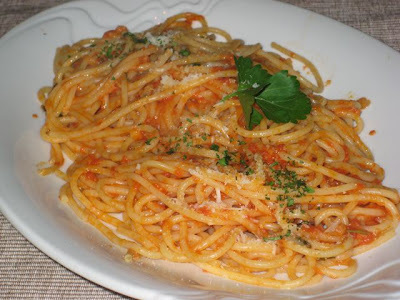 On the second visit, I had a bite of the spaghetti al zingaro, which is made with ginger, chili, garlic, tomato, and marjoram (129 CZK). It had the zesty zing of fresh ginger and the spicy bite of the chili. I'd never tasted a pasta quite like it before, and it took me a few bites to get used to it. We complimented the chef when he came out of the kitchen. I also took the opportunity to ask him if the menu will expand, since it is pretty short. He said probably not. The plan is to make changes every two weeks. But he said he'd make the spaghetti al zingaro any time, on request. Nice guy. My sources tell me he's British, worked in restaurants in Florence, had a Czech girlfriend and... you know how that goes. 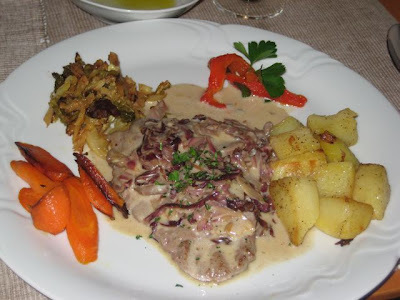 Anyway, on this second trip, I ordered the scaloppine dello chef (235 CZK). It was thinly sliced, tender pieces of beef topped with a Gorgonzola cheese sauce and, if memory serves, fried fennel. It also came with the great carrots and better-prepared roasted potatoes. The dish was OK but didn't grab me nearly as much as the pork dish. Things I didn't get to try: breast of guinea fowl with pancetta, olives, and orange (285 CZK) or the fish of the day (285 CZK). 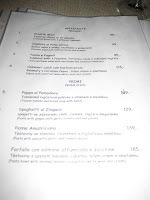 The wine list reminded me of Al Pacino -- short, cheap, and Italian. With all due respect, padrone. I mean that in a good way. Wines by the .2 liter glass were all 35 CZK. 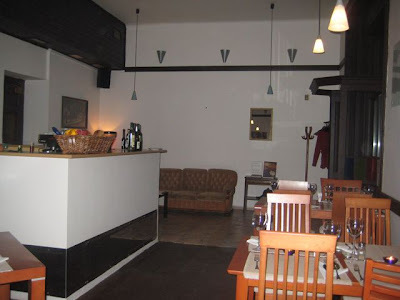 A .75 liter bottle of Chardonnay della Venezia was only 175 CZK, while a bottle of Chianti Colli Senesi was 375 CZK. There was no beer on tap. They had .33 liter bottles of Pilsner Urquell and Budvar for 35 CZK. I ordered dessert on both visits. 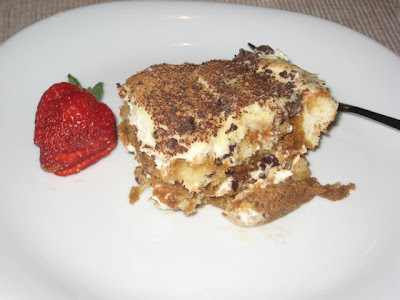 The first was a homemade tiramisu (95 CZK). I'm not a big connoisseur, but this one was really good. The ladyfingers were soaked in plenty of real espresso and liqueur, and each bite revealed chunks of dark chocolate inside. The strawberry was ripe and finely sliced. Yum. On the second visit, I had the panna cotta with brandy and orange (95 CZK). There was an orange sauce but not a lot of brandy flavor. Still, this sweet, creamy dessert tasted heavenly. There was one problem. Ice crystals in the middle. I mentioned it to the waitress, and she confessed the freezer had broken down some time earlier. Such are the opening week kinks in a new restaurant. I wasn't thrilled about it, but I'll say this. It was good enough that I really want to try it again (without the ice crystals). Yes, we'll be going back, even though it wasn't perfect. And not just because we live in the area. I thought that pork was one of the best dishes I've had in a long time and felt the same way about the zingy spaghetti. It also helps that the prices are probably 30% less than what you'd pay for similar cooking in the center, especially since side dishes were included. Now, old school restaurant critics might wait for a restaurant to be open for a month or two to let some issues get smoothed out before writing a review. In the blogosphere, we play by different rules. But they are not new rules. It is not widely known, but we often use old Italian proverbs as our guides. I live around the corner and am quite impressed with this Osteria. They have an excellent value lunch menu, which seems to showcase their regular menu at a lower cost, rather than just serving a cheap pasta each day. Why Clara? Its the owners daughters name! We also went in their first week and I wasn't that impressed. Everything was ok, but they ran out of their house white after one glass and there seemed to be a hair in a pasta dish. Teething problems, perhaps. I'll try the pork next time. People should complain in restaurants,perhaps finding a hair in the pasta should entitle one to a new dish or discount.Anyway the guy cooking does'nt have that much hair!Guess its teething problems. Seems to me that ice crystals in the middle of your panna cotta had nothing to do with a freezer breakdown, unless you wanted them all through your dessert. It's evidence of frozen desserts, period, and ones not properly thawed. Which leads me to believe that some, if not all, of the desserts are made out-of-house and shipped in frozen. 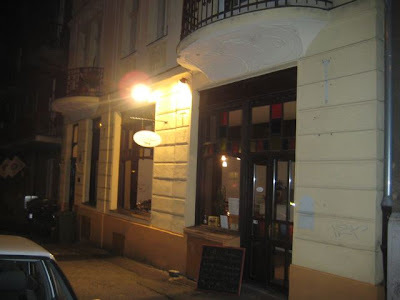 Except, perhaps, the tiramisu, if you're sure it was homemade on the premises and not homemade in Brno or someplace. Grant, obviously, it had been frozen. Whether it was housemade, I don't know. But you took a small amount of information and went off to the speculation races. The crystals were through most of the dessert. The outer edges were OK where it had melted. Sorry if you misunderstood what I meant by "middle." 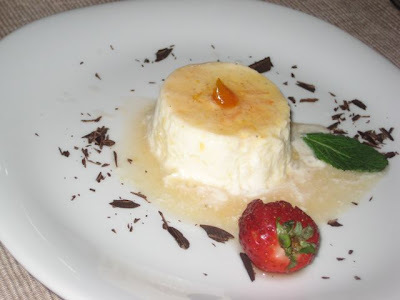 The crystals in high-fat content cream desserts are formed by defrosting and refreezing. End of story. Finally we went to this restaurant. We were lucky to get a table. At the end, the reservation didnt show up, so we could even stay longer. The pork meat was great. The starters were great. Only the deserts were a bit disappointing. Tiramisu was very wet. What I really didnt expected was the size of the portions. So big! I do not mind, I am a big eater.